I’ve shifted this program to this link. Click here to read about The Arthritis Recovery Program. 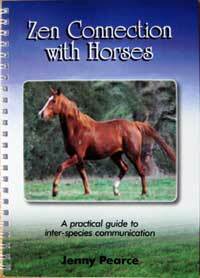 This book with it’s unique combination of book and audio lessons, will help you to find a deep and profound connection with your horse that will open the door to beautiful horsemanship and riding, healing, peacefulness and happiness. It doesn’t matter what kind of riding or style of horsemanship that you do – this new deep connection with your horse will benefit all horse people and their horses. * How to help your horse release old trauma so that he or she can feel confident and safe – and importantly, to heal. Turn your horse relationship into the stress free, happy experience that it’s supposed to be. 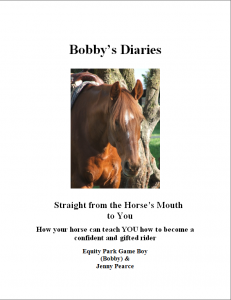 Bobby’s Diaries is about Bobby the horse’s roadmap for us to be a truly confident rider and it’s about how your horse can help you to get the results of a gifted rider – even when you think you’re not. Get your training from the best – get it from your own horse with this revolutionary book, that shows you how to listen to your horse and how to use that to be brilliant with him or her. This book is easy to read and simple to understand and written in a fresh, earthy style. Our emotional wellbeing is so important to our overall happiness and wellbeing – Talk to Your Soul will help you find emotional balance. Have you noticed that great horsemen and women are these amazingly calm people who are not easily rattled? Emotional healing work plays a significant part in becoming a great horseman. You will learn how to release, clear and get rid of old emotional baggage, using a simple and easy to use method that accesses the sub-conscious of your mind. 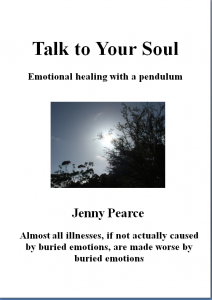 This book gives systematic, step by step instructions on how you can use a pendulum to get at old emotional baggage that is getting in the way of your emotional wellbeing. 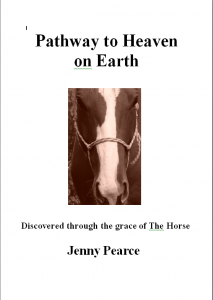 Pathway To Heaven On Earth is an easy to read, punchy little eBook with unique insights that will knock the socks off horse owners and other animal lovers alike – and despite its name, it’s not a religious book. – Learn how the natural connectedness of all beings is meant to help us reach our dreams and bring us great joy and peace. – Make sense of what’s happened in our lives and what’s happening now. This book makes amazing sense of why we feel our feelings, what they are for and how to deal with them in a simple, practical way.